A client is a piece of software you keep on your computer which holds one or more wallets. Here are the current client versions. If you're using an older client please upgrade to the newest version prior to sending/receiving coins. Backup! Backup! Backup your wallet.dat file or private key so you can import them into the latest version of the client. Bootstrap file for Core to save some download time. Is there anyone left here? It seems like this place is kind of dead. Don't let the doge die! This is an alternative version of Dogecoin Core 1.10 with modifications to make it compatible with Dogeparty. Specifically, this adds support for address indexing and the "searchrawtransactions" RPC command. You should use Dogecoin Core 1.10 unless you need these extensions, as it has undergone further testing. I was testing some node.js stuff over holiday and figured I would go ahead and add an SSL to the domain and upgrade everything together. All http request will be denied. This morning at 06:13 UTC, the version 3 softfork activated at block 1032512 (836bf275bd128df8c6aac6606d8ab75bde1b9ed18e9d2dd3f3ccf9aeff7b214b) link. From this point on, all version 2 blocks will be rejected from the network because they can contain less secure transactions. Version 2 blocks are mined with Dogecoin Core 1.8.0 to 1.8.2. If you're still running an old Dogecoin Core wallet, you would save yourself a lot of trouble (it might take longer for your transactions to be fully confirmed and if you relay too many invalid block, newer nodes might ban you) if you're updating asap to version 1.10.0. With this critical consensus issue out of the way, we are preparing some optimizations on 1.10 in a minor release that should make it run even smoother (and hopefully consume less memory.) We will update everyone here once we know more about how that's going to look. for Windows users you probably want to grab the setup-unsigned.exe versions (the .zip files are for anyone who just wants the binaries). BACK UP YOUR WALLET BEFORE YOU UPGRADE. We've had zero problems with upgrades so far, but still, just to be safe. You will have to reindex on first run of Dogecoin Core 1.10, which will take 2-3 hours. I suggest running it overnight. If you use the QT (graphical) client, it will prompt you to reindex. If you run the daemon, use the "-reindex" option when you launch to start the reindex process. Again, this only has to be done once while the index format is updated to add more sanity checks. Your wallet balance will reflect the blocks that have been reindexed, while the process runs, don't panic. Do not attempt to send coins while the reindex runs, however, or you may find you've sent invalid transactions. Even then, we highly recommend updating later if at all possible. This release includes all of the changes in Bitcoin Core 0.9 and 0.10, including a huge speed boost to download/sync, a broad range of security fixes, and the framework for future improvements such as blockchain trimming and smart contracts (yes, you read that right, smart contracts). If you're an individual user please update NOW. If you're a merchant, exchange, payment processor or service provider, please test and update as soon as possible. If you're a miner, please update after the 17th so we have time for the new client to be deployed. This update introduces version 3 blocks (BIP 66 for those who know what that is), which are part of the security fixes, and the more clients update before they're mined, the easier the rollout will be. To re-iterate - seriously, you need to update. This client has been in testing for literal months, it's stable, there isn't another update just around the corner, get this one. http://multidoge.org - MultiDoge is a desktop Dogecoin client, powered by dogecoinj. Ported from the MultiBit Bitcoin client. Android app - Have your Dogecoins always with you, in your pocket! You pay by quickly scanning a QR-code. As a merchant, you receive payments reliably and instantly. If you run 1.10 already, please update! If you want or need to test it, now is a good time! Help in this form is always welcome. Report bugs either here or on GitHub. Please keep in mind, that when you come from a version below 1.10 a reindex is needed. This can take a while depending on your machine. If you update from Beta 1, no reindex is needed :) Thanks for the contributions and support! The more nodes there are the better! We need a large network of nodes operating with diverse hardware and bandwidth. Please, if you'd like to participate get your testnet node synced up before next Saturday. If you want some testnet coins, comment with your address and I'll send some over. The results of this test could have consequences in the ongoing bitcoin max block size debate, afaik there haven't been any real world tests to see if the detractors' claims that bigger blocks will require too much bandwidth are true, dogecoin is a great test bed for that claim since we have 1min blocks. So sync up your testnet node today! Generally very positive; the core network barely even noticed at around 50% of theoretical maximum, with the tools we're using to feed transactions into the network, and the monitoring tools, being the only parts that really showed the load they were under. The nodes themselves took about 6-7% of a single CPU core on an m3.large EC2 node (i.e. decent hardware but nothing really impressive). We're intending to push it further in a much bigger test in October, but the mad panic Bitcoin devs had made around increasing block size made me overcautious that we'd see problems with this test. 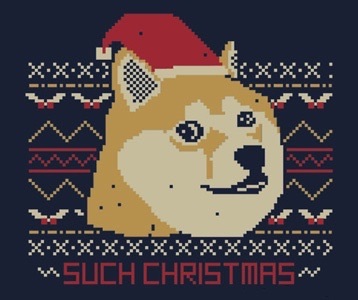 Dogecoin 1.10 is a complete rebuild based on Bitcoin 0.11. This means in terms of the code-base we introduced all the changes between Bitcoin 0.9 and 0.11 into this version of Dogecoin Core. To upgrade from any version below 1.10 you will need to re-index once, as the block database format has changed. If you run the Qt GUI client, it will prompt you to do so on the first start after the update. If you run a dogecoind daemon, you will need to start it with the parameter -reindex once after you updated. This process can take a few hours, depending on the performance of your machine. For this beta release, we decided to disable AuxPoW mining, while further testing is completed. The functionality will be re-enabled in a later release candidate. EDIT: This does not mean we turned off AuxPoW. Just that mining is not possible with this version of the client ;) It will work just like before for everyone else, so this is solely of interest for pool admins. For further explanation of these, see the above mentioned Bitcoin release notes. Dogecoin Core 1.10 introduces headers-first and parallel block synchronization to greatly reduce the initial blockchain synchronization time. It is now possible to add public keys to your wallet that will be held in a "watch only" state. This means you will get information about incoming/outgoing transactions and resulting balance changes. Especially useful to keep track of your paper wallets. One of the reasons why mining is disabled on this release is the introduction of BIP66 which enforces strict rules about how transaction signatures are encoded and therefore will introduce a new block version (3). These rules will only activate once a certain number of blocks are mined with this new version. To not let this happen too early, mining is disabled for now. NOTE: This is not a hard fork, as all existing wallets will accept version 3 blocks, although they'll fail to enforce the new requirements. It is possible to run a Dogecoin node without keeping the full blockchain on your disk. This is currently incompatible with having a wallet on that client due to the fact that some actions regarding a wallet require the full block data. The minimum amount of kept blocks has been changed from Bitcoin to reflect our shorter block times. Please backup your wallet regularly and especially before performing this upgrade. Do not copy your wallet.dat while Dogecoin Core is open. Instead you should either use the backup feature you find in the "File" menu or shut down Dogecoin Core completely before you make a copy of your wallet.dat. Thanks everyone for their continued support! The last thread was filling up, so here's another. Let me know what text (or no text) that you want with it. hey fellow shibes, after the Dogecoin Steam group reached 10.000 members yesterday the huge promotional Giveaway is finally on now! Let's get the hype started! There are plenty of possibilities how you can enter the giveaway. The more you use, the bigger the chances are that you actually win something. It is mandatory to be part of the Dogecoin steam group though. I would also like to point out, that you can get even more additional entries by using the share-option from the giveaway-widget. Every time someone enters via your link, you get additional entries too. IMPORTANT: There will be >>>99<<< winners in this giveaway! So the chances to win something for all of you are huge. The giveaway ends on 24th August which is in about 2 1/2 weeks. There is plenty of time to enter, to share it and most important to promote Dogecoin with it. Use this free chance and get the word about Dogecoin out there! 6 mystery steam keys from various humble bundles by Steam User "McNoob"
Trackmania² Stadium Steam Gift by Steam User "COKAgoufmaster"
10 Keys from the Contest Bundle #2 of coinplay.io (https://coinplay.io/bundle/contest-2) + 10 Keys from the Ready for Summer Bundle of coinplay.io (https://coinplay.io/bundle/summer-2015) + 5 Keys from the Contest Bundle #3 of coinplay.io (https://coinplay.io/bundle/contest-3) + 1 Cities: Skylines Steam Key by "/u/cpt_merica"
Gun Monkeys + Super Sanctum TD Steam Gifts by "/u/rainbrodash666"
Robot Roller-Derby Disco Dodgeball Steam Gift + Dungeon Siege 3 Steam Key + Supreme Commander 2 Steam Key from "/u/XxCannibalxX"
Super Meat Boy Steam Key + VVVVVV Steam Key by "/u/jaredhomer99"
Kill the bad guy Steam Key + Real Boxing Steam Key by "/u/cdeverett"
There is a special entry for the Eve Online Codes, where you can decide if you want to join the giveaway also for the Eve Online codes too or not. If you should win the codes and didn't wanted too, I will redraw until I find someone who actually wants them. The same applies for the Payday 2 Soundtracks. Praise Lord Gaben and the moon!